Democratic presidential candidate Hillary Clinton said Monday that she's feeling better since falling ill at a 9-11 memorial ceremony, but she never lost consciousness and didn't think her pneumonia diagnosis was significant enough to disclose beforehand. "I just didn't think it was going to be that big a deal," she said of the pneumonia diagnosis she received Friday. She told CNN's Anderson Cooper 360 that despite doctor's orders to rest for five days, she thought she could "just keep going forward and power through it and that didn't work out so well." Clinton abruptly left the ceremony and appeared to stumble while she was waiting for her motorcade. Asked whether she fainted, Clinton replied: "No, I didn't. I felt dizzy and I did lose my balance for a minute. But I got in, once I could sit down, once I could cool off, once I got some water, I immediately started feeling better." Clinton's evening interview, in which she promised to release more information at some point, came as her campaign scrambled to head off lasting damage from a difficult weekend. Aides are promising to release more of her medical records following her bout of pneumonia and conceding they were too slow in providing information about her condition. An outbreak of respiratory illness swept through Hillary Clinton's campaign in the weeks before she was diagnosed with pneumonia, campaign aides said Monday. The Democratic presidential candidate abruptly left Sunday's event after feeling "overheated." A video later posted on Twitter showed her staggering and eventually slumping forward before being held up by three people as she was helped into a van. 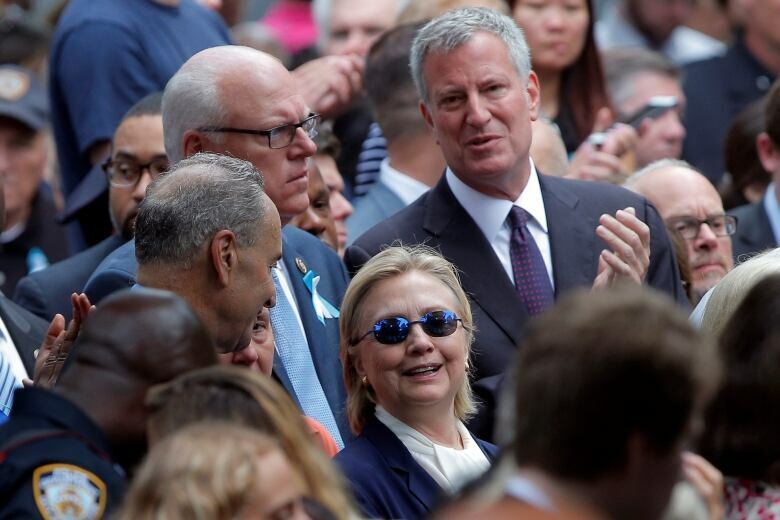 On Sunday, her campaign answered questions about Clinton's health and whereabouts with two short statements, both issued hours after she left the memorial in lower Manhattan. More than 20 hours later, her campaign gave a fuller accounting of the episode, which sparked a wave of bipartisan concern about her health and questions about her political transparency. Clinton's husband, former president Bill Clinton, said in an interview Monday with PBS's Charlie Rose that Hillary Clinton was "doing fine" after a good night's sleep. He added that if there are more health problems that caused her apparent weakness, "then it's a mystery to me and all of her doctors." He said that "on more than one occasion" over the years "the same sort of thing's happened to her when she got severely dehydrated." As family members of 9-11 victims read the names of the nearly 3,000 people killed in the attacks, she decided to leave and get a drink of water. She was wearing a wool suit and had been diagnosed with pneumonia on Friday, a fact her campaign had not made public. She waved to reporters and said: "I'm feeling great. It's a beautiful day in New York." She was then driven to her home in suburban Chappaqua, N.Y.. The public was left in the dark about Clinton's whereabouts for about 90 minutes, sparking widespread speculation about her condition. That was a mistake, Fallon said. "It's just the kind of thing that if it happens to you and you're a busy, active person, you keep moving forward," Clinton said on CNN. Clinton's doctor, Lisa R. Barback, later came to her home and conducted an examination. In a statement released by the campaign eight hours after the incident, Bardack said the 68-year-old Clinton "became overheated and dehydrated" at the 9-11 ceremony. By the end of the day, she was "rehydrated and recovering nicely," the doctor said. Campaign aides said it was Clinton's decision to attend weekend fundraisers and the Sunday ceremony, despite Friday's diagnosis. Late Sunday evening, she cancelled a California campaign swing scheduled for early this week. Her husband will headline some of her events, an aide announced late Monday. Fascination with Clinton's health 'quite bizarre,' says Canada's ambassador to the U.S.